Living a Fit and Full Life: Let Playtime Come Alive with Build & Imagine StoryWalls! Let Playtime Come Alive with Build & Imagine StoryWalls! What we play with matters. Toys help to shape our view of the world and develop important skills. Building toys have been one of hottest categories, and I just wasn’t seeing a lot of options that are especially engaging for girls. So what I did was combine several things girls have historically loved. Build & Imagine StoryWalls are like building blocks meets dollhouse meets dress-up dolls. It’s a unique mashup featuring adventurous characters and rich illustrated details that inspire girls and boys alike to build and imagine. In the past, toy companies designed their construction toys almost exclusively for boys. Thankfully, they are now starting to invite girls to build, but many are doing so by taking their existing construction sets and turning them pink. I call it “pink think”. We can approach toy design in a more thoughtful way, and doing so is important. The simple act of combining shapes to form a three dimensional structure helps kids to develop foundation skills for science, technology, engineering, and math (STEM). Skills like spatial reasoning, problem solving, creativity, and design. Toys can make a difference. Let’s invite all children to Build and Imagine. Thank you for your support on this fun journey. Build a scene and imagine countless stories. Woof! Meow! Squawk! Help Anna and Ethan prepare the local shelter pets for adoption day by providing each pet with a special portrait. Build a studio with the illustrated magnetic panels, then dress the wooden pets in crazy outfits and arrange wacky scenes for the dolls to capture with their camera and paintbrushes. Easily change things up and create a whole new adventure for endless imaginative play. It’s the fun of a dollhouse with the enrichment of a building set. Pet Portrait Studio is the winner of Parents’ Choice Gold Award and the Tillywig Best Creative Fun Award. Watch your child become a designer, builder, and storyteller right before your eyes. Build & Imagine’s colorful illustrated StoryWalls connect magnetically to build a world where dress-up characters work and play. Build the studio a new way, every time you play! Illustrated StoryWall panels connect magnetically. Dress the pets in crazy outfits and arrange wacky scenes with magnetic accessories that stick to the panel walls and wooden characters and pets. Let your imagination run wild! Change up your scene so the fun never stops. When playtime is over, Build & Imagine StoryWalls are quick to put away (or throw in a bag for travel). The panels stack neatly and the re-usable box has a convenient tray to store each piece. Recommended for girls and boys ages 4 to 8. 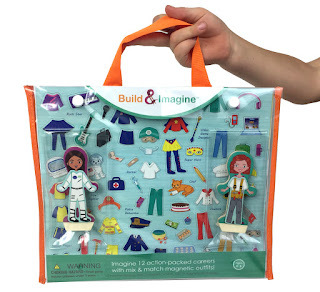 Dream of 12 action-packed careers with mix & match magnetic outfits and wooden dress-up dolls from Build & Imagine! Careers featured are: space explorer, police detective, the president, rock star, video game designer, doctor, chemist, builder, fire fighter, chef, chemist, and professional soccer player. Imagine the possibilities! Winner of Dr. Toys Top 10 Creative Toys of 2016! Includes 75 colorfully illustrated magnetic clothes and props that attach to two wooden dolls. Features a reusable carrying case for easy storage and travel, and 2 standing magnetic scenes (a town and the moon) to enhance the imaginative play possibilities. Each wooden doll is 3.5” tall and features a plastic base so it can stand on its own. This is a great gift item to introduce a child to the world of Build & Imagine, or a fun way to extend the storytelling possibilities if you already have Build & Imagine StoryWalls building sets. The characters and magnetic clothing are compatible with other Build & Imagine sets. The carrying case also provides a helpful way to store your Build & Imagine magnetic accessories and dolls. Let playtime come alive with Build & Imagine StoryWalls! Build & Imagine StoryWalls are incredibly fun and super unique. Watch your child become a designer, builder, and storyteller right before your eyes. Build & Imagine’s colorful illustrated StoryWalls connect magnetically to build a world where dress-up characters work and play and my kids absolutely love them. My kids love playing with dolls and changing their outfits but often have a hard time doing so which is why I love how easy Build & Imagine makes it to swap out outfits. Since they're magnetic my kids can simply remove them and attach them. It's as easy and can be! My kids received Build & Imagine's Pet Portrait Studio and Career Dolls and couldn't have been more excited. They love pets so this was right up their alley, plus with the Career Dolls set they had an amazing selection of accessories. I love how colorful everything is and how easy Build & Imagine's Pet Portrait Studio was to put together. You can dress up the dolls and pets for hours of fun imaginative play. 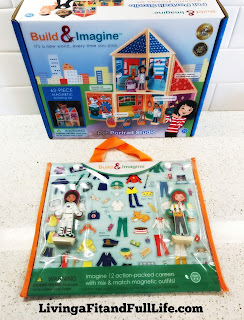 Build & Imagine's Career Dolls set includes 75 colorfully illustrated magnetic clothes and props that attach to two wooden dolls and provide kids with all they need to be as creative as they want. 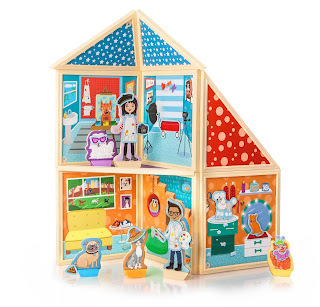 Build & Imagine's Pet Portrait Studio and Career Dolls set is the perfect way to encourage imaginative play! Click HERE to find a store near you that sells Build & Imagine! Click HERE to learn more about Build & Imagine! Follow Build & Imagine on social media!